Most Wizards are from Europe and for us, not using a duvet cover is like making a Peanut Butter and Jelly sandwich without the Peanut Butter. I remember when I first came to this country I was shocked when I realized all I have for sleeping is a blanket and a sheet. I believe it took me a few years when I finally found duvet covers at IKEA. OK so: what is duvet cover? It’s like a pillow case but for your blanket/duvet/comforter. It’s comfortable– using a sheet between your body and your comforter makes no sense as sheet always gets tangled or ends up at the foot of the bed by morning (yuck, I always think of that when in hotel: they don’t wash those comforters after each guest so you’re pretty much mixing your dead skin cells with at least 10 previous guests who slept in that bed). It’s hygienic-like I mentioned previously: you shed dead skin when you sleep. You also sweat. And then there’s Netflix and Chill…Your sheets should be washed once a week. And true, you can wash most comforters but we all know you don’t because they’re bulky and take a long time to dry. Besides, washing them every week will make them lose color so you need a new comforter every few months. And I don’t mean to freak you out but dust mites also live in your bed and their favorite food is your dead skin. Sidenote: even if you use a duvet cover, you should still throw your comforter in the dryer every once in a while to kill the dust mites and freshen it up a bit. My dryer has a Steam Sanitary option but if yours doesn’t then add a small wet towel in it (or wash and then dry the entire thing if possible). 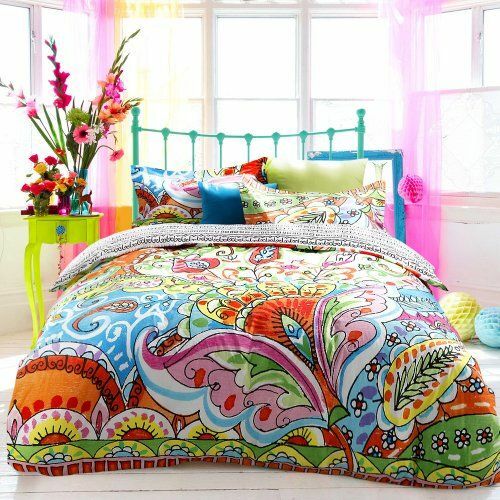 It’s beautiful-There’s lots of cool designs so with just a quick change of bedding you can change the look of your entire room.Take a look at these beauties! Listen, I know it’s a pain to change out the duvet covers. If you don’t know what you’re doing it can take a long time to get them changed. But come on, watch a few videos and learn. If you’re lucky enough to have Wizard of Homes clean your home then feel free to leave out clean sheets and covers, we’ll be glad to take care of that for you, no extra charge! But really, sleep quality is very important so please, change your sheets and use a duvet cover.